Owners of Verizon's Samsung Omnia can take the leap forward to Windows Mobile 6.5 with a cooked ROM that is available already. From what it seems so far, it is pretty stable and you'll be able to wow your friends with it. The cooked ROM for the GSM version of the phone has been available for some time now; so CDMA owners can rejoice. If you are really itching to try it, follow the steps provided on Modaco's web site and let us know what you think about it. We're not sure if the photo that was taken was of the actual cooked ROM running on the Omnia. The icon on the top right shows the phone is plugged in to a power source when in fact it is not. Still, it's a pretty looking image of what WM 6.5 looks like on the Omnia. Would downloading this WM6.5 from Modaco void any warranty from Verizon? Yes. Any ROM or program not specifically "Endorsed" by Verizon is subject to voiding your warranty. BUT...There is a ROM floating around that, as long as you don't completely brick your phone...can get it back to an original enough condition. Umm....The picture is not of the i910, but the i900 GSM Omnia. The CDMA Omnia WM6.5 ROM doesn't have any battery display issues. On another note...huge thanks to WoZZeR and the rest of the guys at Omnia.modaco.com for making the phone completely worth owning. i have the new cooked ROM on my CDMA i910 Verizon Omnia and love it so far! Love my unlocked GPS finally and running SpB Mobile Shell3 which is prolly the best UI out there you can get for Windows! Next I would have to say PointUI Home2!! I think tonight i'am going to flash my i910 to the WM6.5 ROM!!! To my knowledge, Backup Assistant it not available on the Omnia...BUT, Google Sync is and will keep all of your contacts, calendar entries, even caller ID pictures backed up for you. SPB Shell is a completely different type of program. It doesn't change the ROM at all, so it doesn't matter if you install and then uninstall it. That's the great thing about a SmartPhone...If you set yourself up right, you can format the phone on the fly and have everything reinstalled fresh in an hour at most. That said...I am using WoZZeR's 6.5 M2D ROM, and so far, I'm quite happy with it. Though I will try out the 6.5 lite ROM with SPB MS3 tonight. The Omnia doesnt have backup assistant. You should be using HTC data backup or Sprite backup for this type of phone. Or any WinMo PDA. 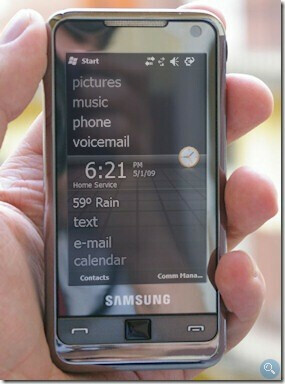 No, Spb Mobile Shell 3 makes the phone much more user friendly and fun!! Although PDA's/Smartphones cant install back-up assistance. But their are other and better options to back up your contacts,SMS, and other personal info!! The Omnia is definitely worth it!! Silly question, but would the Winmo 6.5 ROM from Modaco work on or just fry my XV-6900? Got the Winmo 6.1 upload when I replaced my old XV-6900 and like to try and be cutting edge even if the phone isn't anymore. Your input would be greatly appreciated. Tnx in advance.